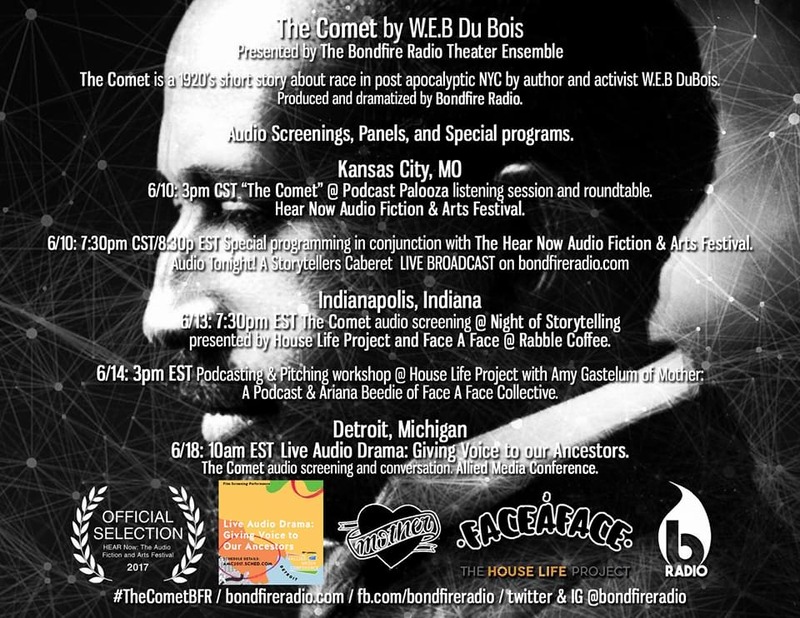 Bondfire Radio’s The Comet by W.E.B DuBois has been selected as a Silver Podcastpalooza Official Selection at the Hear Now Audio Festival in Kansas City, Missouri; as well as a workshop selection at the Allied Media Festival in Detroit, Michigan! A workshop and audio screening of The Comet has been added in Indianapolis, Indiana as well! 6/10: 3pm CST :“The Comet” @ Podcast Palooza listening session and roundtable. 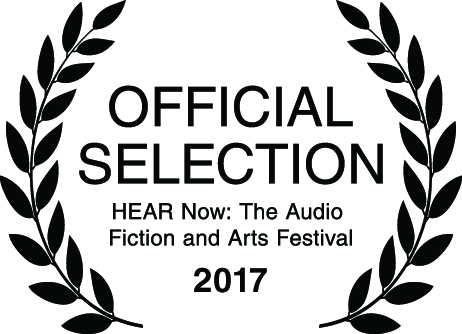 Hear Now Audio Fiction & Arts Festival. 6/13: 730p EST The Comet audio screening @ Night of Storytelling presented by House Life Project and Face A Face @ Rabble Coffee. 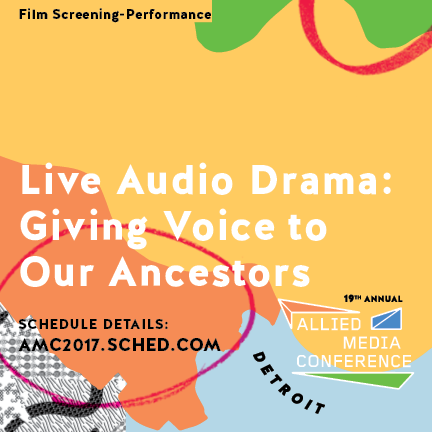 6/18: 10a EST Live Audio Drama: Giving Voice to our Ancestors. The Comet audio screening and conversation. Allied Media Conference. 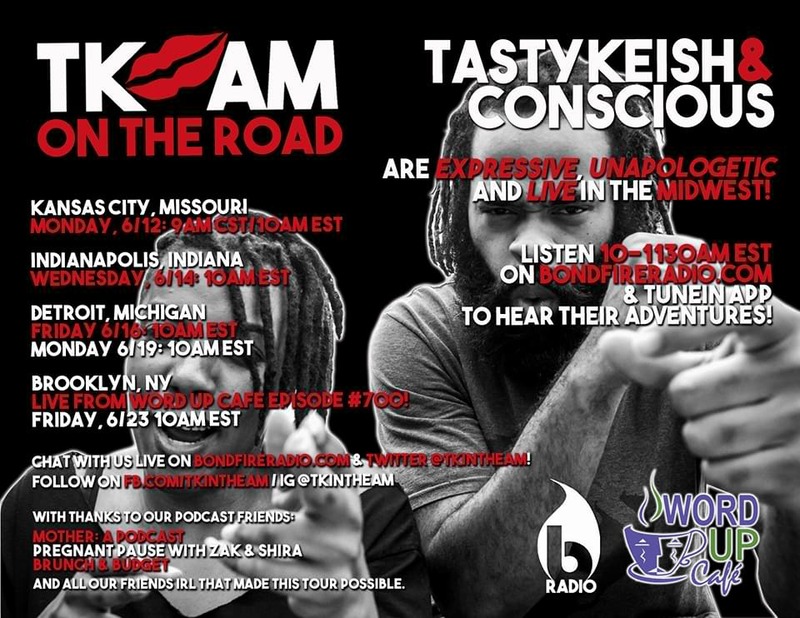 With TK & Conscious on the road they had to take TK in The AM with them! Tune in every Monday, Wednesday, & Friday 10-1130am EST right hear on bondfireradio.com and tunein app for their Expressive and Unapologetic Tour of the Midwest! Chat with us live on bondfireradio.com and twitter @tkintheam! And all our friends IRL that made this tour possible.